What if your valuation reports could have a two-way conversation with your clients? How would that improve the usability of your work product? Could it increase the value of your firm’s intellectual capital? In this, the author discusses how Alexa Voice AI can deliver a calculation report to a client. What if your valuation reports could have a two-way conversation with your clients? How would that improve the usability of your work product? Could it increase the value of your firm’s intellectual capital? To help answer these questions, I published the first Alexa Voice AI valuation report, which you can access free of charge. To get the most out of this brief overview, it is a good idea to click the images of the Alexa Echo Dot speakers you see in this article. Each image links to audio recordings of the actual Alexa Voice AI conversation and demonstrates how Alexa can increase the usability of valuation reports. The other reason I published this sample valuation as an Alexa skill is because sometimes seeing a technology in action is the simplest way to understand how it can benefit you. 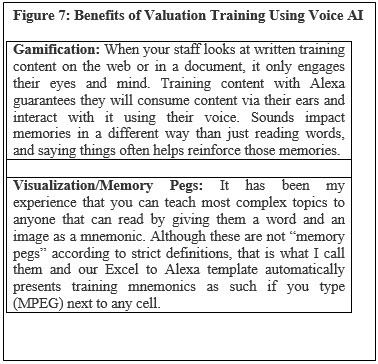 So, my goal with this article is for you to be able to experience Artificial intelligence (AI), particularly the natural language processing technology (NLP) and natural language understanding technology (NLU) in the context of valuation reports and staff training. This article and the NACVA webinar on the topic do not go into detail about NLP or NLU, since you can easily Google (via voice or text) either term to find videos on the science that makes smart speakers such as Alexa work like magic. 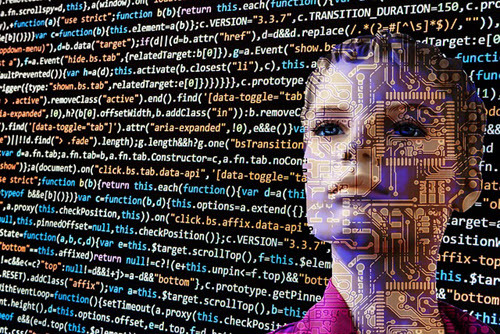 If the feedback to this article is positive, I will post samples of cost of capital and Market Approach (guideline public company and guideline transaction methods) that take advantage of smart speaker AI. It is my opinion that smart speakers represent the easiest way for finance professionals, consultants, valuators, and CPAs to incorporate Voice AI into their practices. I also believe that doing so represents a unique opportunity to develop and profit from intellectual capital that was previously only available to application developers or large companies. 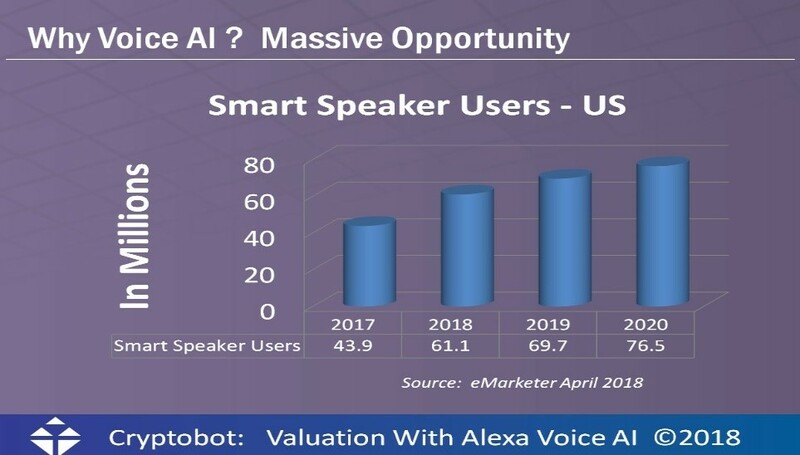 On October 31, 2018, I presented a webinar on incorporating Alexa Voice AI into valuations. The overwhelming response from attendees was very positive (most rated the program as excellent). However, some people felt it was not clear exactly how Alexa Voice AI could improve their valuations or what the next steps to incorporating it would be. 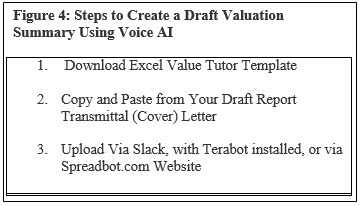 My goal with any product, speaking engagement, or other effort is always a grade of 100%, so I have written this article and loaded a couple of Alexa Voice valuation bots, or “skills”, I developed that any accountant, consultant, or finance person can try out immediately for free. I would only ask that you communicate your ideas of how these tools might benefit your practice, your clients, or the profession. 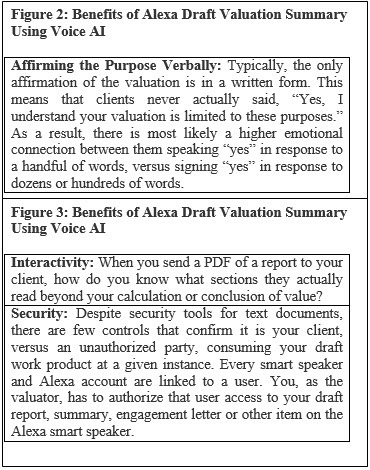 The first dialogue that follows is a real conversation between me and the draft valuation report on a smart speaker, powered by Alexa Voice AI. I have called out sections within the conversation to highlight what I believe are some of the benefits to valuation practitioners and their clients that are difficult or impossible to get using PDF reports. You can click on the Alexa Speaker image at the right to an audio recording of the conversation with Alexa and me (as business owner Mike Jones in this the first sample and as a newly hired analyst in the second sample). 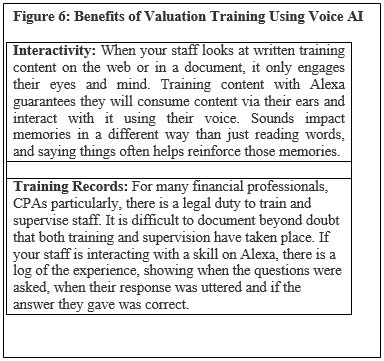 Alexa Voice AI: “Great, before reviewing a summary draft estimate in from the draft valuation report, there are a couple of items Kuesick Valuations Advisors would like to remind you of, Ok? Alexa Voice AI: Great! You hired Kuesick Valuation in January of 2007 solely to provide a “conclusion of value” for 10,000 common shares of your family business, Peachtree Plumbing, as of December 31, 2006. Your goal in engaging Kuesick Valuation was to get a conclusion of value report that you and your wife will use to set a basis for your planned donation stock to the Wounded Warrior Project; a tax-exempt 501(C)(3) nonprofit organization. Are all of those facts correct Mr. Jones? Mike Jones: Yep, that is correct. Alexa Voice AI: Excellent! The word “value” and the expression “fair market value” in particular, mean different things to different people outside of the private company valuation profession. But since your valuation is being prepared to comply with the IRS rules regarding a planned donation to a tax-exempt nonprofit organization, the Wounded Warrior Project, Kuesick Valuation must only use the IRS accepted definition of fair market value. Based on the IRS’ accepted definition of fair market value, the draft estimated value of one non-marketable (not publicly traded on a stock exchange), non-controlling shares of Peachtree Plumbing common stock as of December 31, 2006, is $100 per share. If the purpose of your valuation were something different, such as a strategic sale to a specific buyer, the estimated value of 10,000 common shares would most likely be substantially higher on a per share basis. Similarly, if a 50% or greater interest in your company was being valued (a control interest), the draft estimated value would most likely be higher on a per share basis. 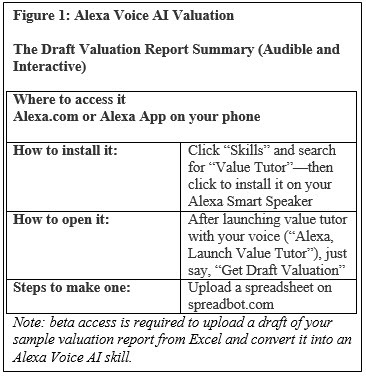 Alexa Voice AI: Did you have a chance to read the draft valuation report that Kuesick Valuation e-mailed to you yesterday? Alexa Voice AI: Great! Please have a look at page 18 in the draft valuation report you were e-mailed which discusses Peachtree Plumbing’s cash balance as of 12/31/2006 compared to that of peers in the industry. This is an item you should be prepared to discuss before Kuesick Valuation delivers their final report. Thanks for allowing me to summarize Kuesick Valuation’s draft valuation report of Peachtree Plumbing common stock of as December 31, 2006. The next dialogue that follows is a conversation between me and a valuation training test I created on Alexa to help new valuators commit the eight factors of Revenue Ruling 59-60 to memory. 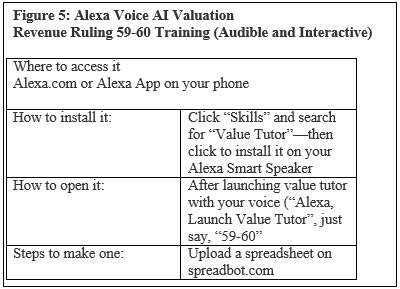 As with the previous draft valuation report example, anyone that can use Excel can create this voice AI script for Alexa and have it apply logic to determine if an analyst has memorized the eight factors of Revenue Ruling 59-60. If they have not, Alexa will give them an opportunity to guess again or to hear the answer. Newly Hired Staff (Jessie Ann Uhlist): Alexa, launch Value Tutor. Alexa: Welcome to Value Tutor, please say learn and topic name to become a better valuator today. For instance, you can say, “Learn 5960,” to learn about revenue ruling 5960. If you’re not sure, just say, “List topics,” for a list of topics. Jessie Ann Uhlist: Learn 5960. Alexa: I heard 5960, is that correct? Alexa: Great. Let’s test your knowledge of 5960. Would you like a memory peg before we start? Alexa: Okay, your memory peg is HEBEDIPP, picture Disney’s Goofy character, who is originally named Dippy Dog, and that will help you retrieve the memory peg initially. Let’s start with the first two factors in revenue ruling 59 to 60, the H and the E, what does the H in HEBEDIPP stand for? The first factor. Alexa: Yes, that’s correct. The history and nature of business. Okay, next question, what does the first E in HEBEDIPP stand for? The second factor. Alexa: Yes, that’s correct. The economic outlook of the U.S. and that of the specific industry. Okay, next question, what does the B in HEBEDIPP stand for? The third factor. Jessie Ann Uhlist: Book value. Alexa: Yes, that’s correct. The book value of the subject company and the financial condition of the business. Okay, next question, what does the second E in HEBEDIPP stand for? The fourth factor. Jessie Ann Uhlist: Earnings capacity. Alexa: Yes, that’s correct. The earnings capacity of the company. Okay, next question, what does the D in HEBEDIPP stand for? The fifth factor. Alexa: Yes, that’s correct. The dividend paying capacity of the company. Okay, next question, what does the I in HEBEDIPP stand for? The sixth factor. Alexa: Yes, that’s correct. Whether or not the company has good will or other intangible value. Okay, next question, what does the first P in HEBEDIPP stand for? The seventh factor. Jessie Ann Uhlist: Prior sales. Alexa: Yes, that’s correct. Prior sales of stock and the size of the interest to be valued. Okay, next question, what does the second P in HEBEDIPP stand for? The eighth factor. Jessie Ann Uhlist: Public comp. Alexa: Yes, that’s correct. The market price of equity interest of companies engaged in the same or similar line of business having their equity interest actively traded in a free or open market, either on an exchange or over the counter. You’ve become a valuator in two minutes today. Have a great day. I believe there are many good reasons for certain valuators and many financial professionals to integrate Alexa into their workflows. I hope that the brief examples included above have given you some ideas. In addition to some of the potential use cases we have discussed, I have included a couple of statistics that I believe make the case for incorporating voice AI solutions into almost every business. Two months from now, at the end of this year (2018), there is expected to be 61 million smart speaker users just in the U.S. There are some additional statistics that I think have a huge impact on everybody’s business, and some of these have to do with how these user groups skew. As you might expect, a large portion of smart speaker users are millennials, and if you do surveys of millennials, you will find that most of them prefer to interact with a chat bot, opposed to interacting with, say, a webpage, and certainly compared to using a telephone to speak with a live human. A lot of people that have grown up with computers are more comfortable talking to a computer as long as it is accurate and understands what they want when they speak. As a valuator, this represents a huge opportunity. To appreciate it, simply consider what happens to your valuation report when people get it. In many cases, users outside of the valuation profession search the report for one thing: the number (or range) that you came up with. Maybe they will also judge it for the weight, to make sure that they got their money’s worth, and the rest of it is effectively going to become a paperweight, except for other professionals that are going to scrutinize how you arrived at your conclusion or calculation. But in most cases, the people scrutinizing your conclusion beyond the value you estimated are not the same people that are funding your remuneration. The “50%” of searches being conducted by voice statistic has been questioned by many people, including some of the authors. However, if by 2020, which is only a couple years from now, 30% of all searches are conducted by voice, doesn’t it make sense for your knowledge and expertise to be discoverable, or even accessible, via voice? Hopefully a few of the tools we have discussed here will help you get started in doing so. You must send your e-mail address to get a beta tester approval for these valuation skills through Alexa. You can write me directly at Lorenzo@spreadbot.com to start the process. Lorenzo Carver, MS, MBA, CVA, ABV, CPA is founder and CEO of Liquid Scenarios, an automated valuation software, data, and services company responsible for the first one-click valuation solution for complex, illiquid securities. He is the inventor of the Carver Import Algorithm, Search2Model, a patented valuation technology, and author of Venture Capital Valuation published by John Wiley & Sons. Mr. Carver has over 40,000 hours of valuation related experience and his Liquid Scenarios automated valuation software, services, and data is used to value thousands of venture backed companies, including industry changing successes like Facebook, Twitter, Dropbox, and Uber. Mr. Carver speaks regularly on valuation topics, is one of a handful of valuation professionals on the instruction team for new valuation professionals qualifying for the National Association of Certified Valuators and Analysts business valuation credential, was a past co-chair of NACVA’s annual conference, and has authorized webinars for NACVA including “Five Mistakes Your Auditor Made”, “VC OPM School” and “Venture Capital Valuation Forum.” He has presented his valuation technology at the Stanford Summit (2007), spoken on crowdsourced valuation using APIs (Wall Street Green Trading Summit at New York Times building (2010) and has spoken at the NACVA national conference in 2008, 2012, 2013, and 2014. Mr. Carver can be contacted at (650) 690-2169 or by e-mail to Lorenzo@spreadbot.com.